The DBDU 6-COLOR (Desert/Arid) Camouflage Pattern has been first introduced by the United States Armed Forces in 1985. It was distributed and approved for all branches of the US Military Forces (Army/Navy/Air Force) during the First Gulf War. Also called "Chocolate Chip" camouflage, this camouflage is based on a Six-Color pattern (Pinkish-Tan, Light Green, Medium Brown, Dark Brown and Black&White Flecks) and it is primarly designed for High Desert & Rocky Environments. This pattern was progressively replaced by the 3-Color Desert Combat Uniform (DCU) since 1990 in order to be more versatile in all types of desertic areas. Currently in use by National Armies, International Military Forces and Special Security Forces. 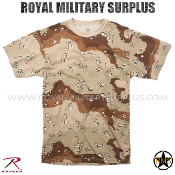 The Canada based Royal Military Surplus online store offers range of quality Military Kits, Combat Uniforms, Tactical Gear and Military Apparel in DBDU 6-COLOR (Desert/Arid) Camouflage Pattern.